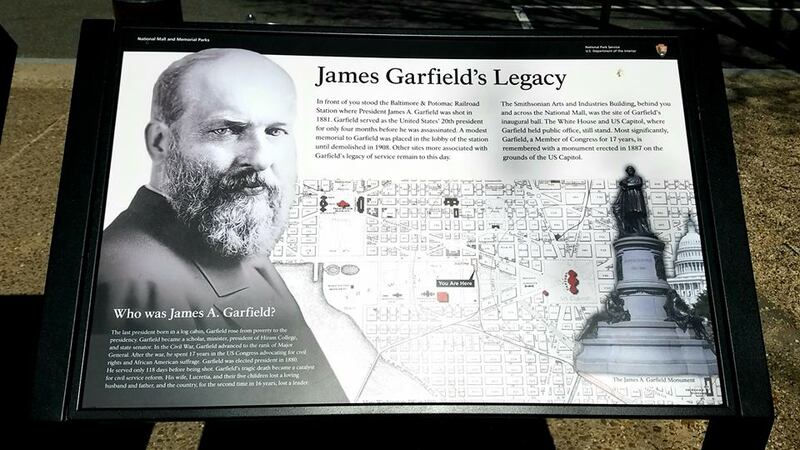 President James A. Garfield was the 20th president of the United States, serving from March 4, 1881, until his death by assassination six and a half months later while waiting to catch a train at the Baltimore and Potomac rail station. The site where it happened s just a few hundred yards from the 20th President’s official Presidential Memorial in an area of the city that has gone through many changes since the train station’s building and tracks were demolished in 1908 during a redesign of the National Mall. The National Gallery of Art’s West Building is now located there (MAP). But one thing stayed the same at the site for the first 137 years after President Garfield’s assassination. That was the absence of a plaque or historical marker to indicate what happened there on July 2, 1881. But that recently changed. So on this bike ride, I went there to see the new historical marker. When President Garfield was elected in 1880, a man named Charles Julius Guiteau falsely believed he had played a major role in his victory. He also thought he should be rewarded with a consulship for his efforts in electing the new President. So he submitted applications to serve in Paris or Vienna, despite the fact he spoke no French or any other foreign language. But when the Garfield administration rejected his applications, he decided it was because he was part of the Stalwart faction of the Republican Party, and President Garfield was affiliated with the opposing Half-Breed faction of the party. Guiteau was so offended at being rejected for a consular position that he decided President Garfield had to die so that Vice President Chester A. Arthur, who was a fellow Stalwart, would succeed him. He thought this would not only end the war within the Republican Party, but would lead to rewards for fellow Stalwarts, including himself. The wounded President was taken upstairs to a private office in the train station, where several doctors examined him. There they probed the wound with unwashed fingers, another thing that is difficult to imagine today. At Garfield’s request, he was then taken back to The White House. The physician who took charge at the train station and then at the White House was Willard Bliss, an old friend of the President’s. About a dozen physicians, led by Dr. Bliss, were soon probing the wound, again with unsterilized fingers and instruments. During the President’s treatment, Alexander Graham Bell attempted to locate the bullet with a primitive metal detector. (The use of X-rays, which likely would have helped the President’s physicians save his life, would not be invented for another fourteen years.) However, he was unsuccessful. But they were able to help keep Garfield relatively comfortable in the stifling heat that he had been trying to escape with one of the first successful air conditioning units, which reduced the temperature in the sickroom by 20 degrees. During the weeks of intensive care after being shot, Garfield would alternately seem to get better and then take turns for the worse. He developed an abscess around the wound, which doctors probed but most likely only made worse. He also developed infections that cause him to have a fever of 104 degrees, and he lost a considerable amount of weight. Eventually, Dr. Bliss agreed to move him to Elberon, part of Long Branch, New Jersey, where his wife had been recovering from an illness at the time her husband was shot. There, Garfield could see the ocean as officials and reporters maintained what became a death watch. Garfield eventually succumbed to a combination of his injury and his treatment. On September 18, Garfield asked Almon Ferdinand Rockwell, a friend and business associate who was at his bedside, if he would have a place in history. Rockwell assured Garfield he would, but told him that he still had much work to do. The President responded, “No, my work is done.” He died later that night. According to many medical experts and historians, Garfield most likely would have survived his wounds had Dr. Bliss and the other doctors attending to him had the benefit of modern medical research, knowledge, techniques, and equipment. In fact, much like President Ronald Reagan after the assassination attempt at The Washington Hilton here in D.C., Garfield would probably also have survived being shot. Instead, the treatment he received at least contributed, and most likely caused his death. It is thought that starvation also played a role in President Garfield’s death. Four presidents have been assassinated while in office. 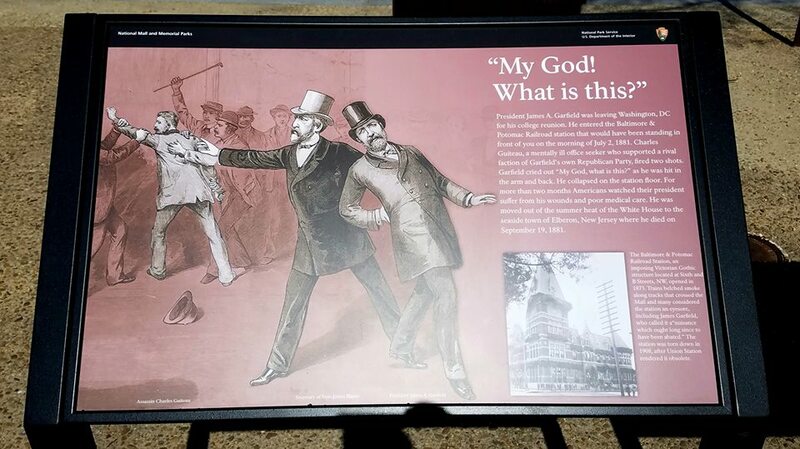 And two of them occurred here in D.C. President Lincoln was killed at Ford’s Theater in 1865, and just 16 years later President Garfield was shot by Guiteau less than a thousand yards away from where President Lincoln was shot by John Wilkes Boothe. There were already official markers for President Lincoln at The Petersen House in D.C. where he died, President William McKinley in Buffalo, New York, and President John F. Kennedy in Dallas, Texas. Now all four sites have been properly recognized. I’ve now been to the two sites here in D.C. The other two, however, are a little too far away for a lunchtime bike ride. I love the historical backgrounds, very interesting!